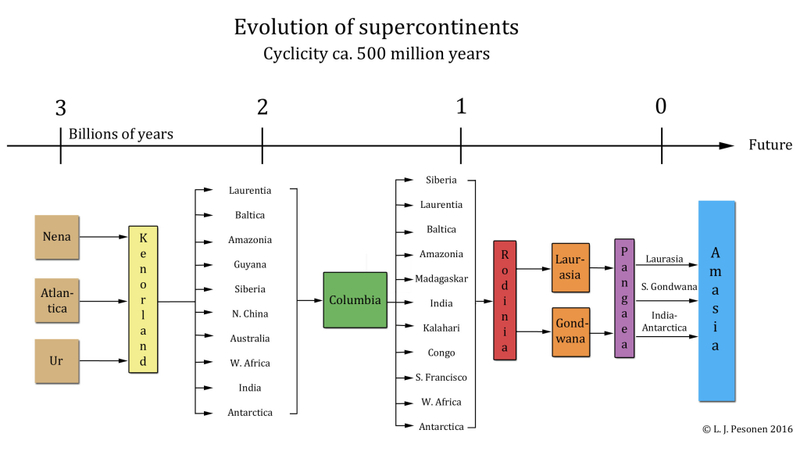 The continents gather together and form the Columbia supercontinent 1.8 – 1.5 billion years ago. 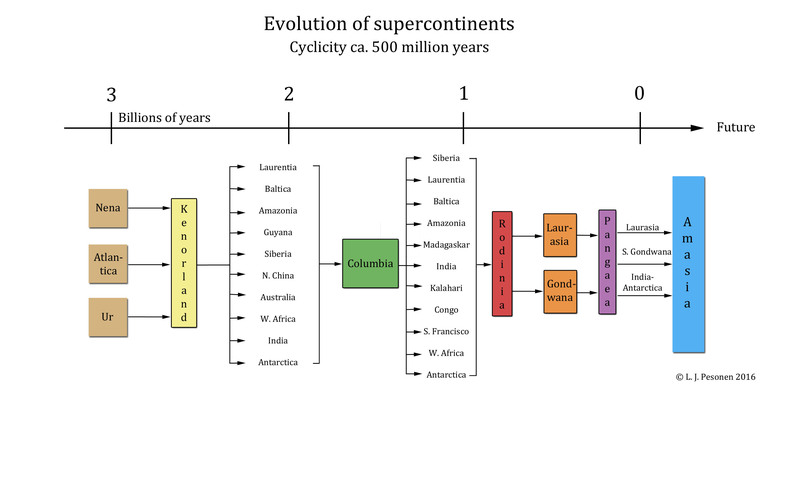 The Supercontinent cycle. During the history of the Earth, continents have several times collected together as supercontinents and again broken down to smaller parts. Image: Lauri Pesonen. A supercontinent is a large mass of land that occurs when continents or cratons gather together. The assembly continues in some parts of the continent, while other areas start to diverge. Diverging eventually causes the supercontinent to break up completely into separate continents. This event is complex and there are many processes that are involved. In geology these are called supercontinent cycles. 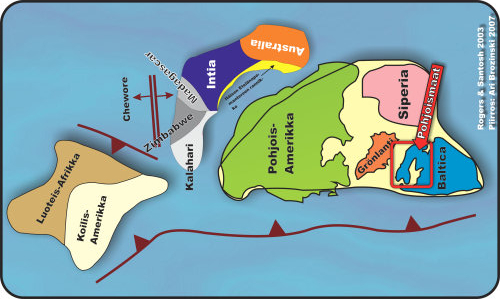 Ancient supercontinents have been modelled and reconstructed in the manner of puzzles. Also paleomagnetic data, fossils, mountain ranges and glaciers can be used to find out the configurations of ancient continents. For example, presence of same fossils or similar mountain ranges at separate continents helps at the detective work. The piecing together the latest supercontinent, Pangaea, is relatively straight forward. However, the configurations of the older supercontinents are far more challenging and are not yet fully agreed. The supercontinent Columbia formed from the assably of several cratons 1.8 – 1.5 billion years ago. The Columbia supercontinent has also many other names, such as Nuna, Hudsonland or Capricornia. At least two separate mountain-forming regions led to the formations of Columbia, one between North-America (Laurentia) and extended Ur, and another between the southern areas of Laurentia, and northern South-America (Atlantica). Columbia is a relatively short-lived supercontinent, since extended Ur started to break up while Columbia was still growing. Rift valleys inside of the old cratons in eastern India and North-America bear still evidence of Columbia. The valleys were formed when the lithosphere-plates drifted apart and the lithosphere between them began to sink. In this case, they were formed in the early stages of the destruction of Columbia, which finally lead to the formation of the next supercontinent, Rodinia.